So today’s Feast in the Church Calendar is the Beheading of John the Baptist. Happy, huh? 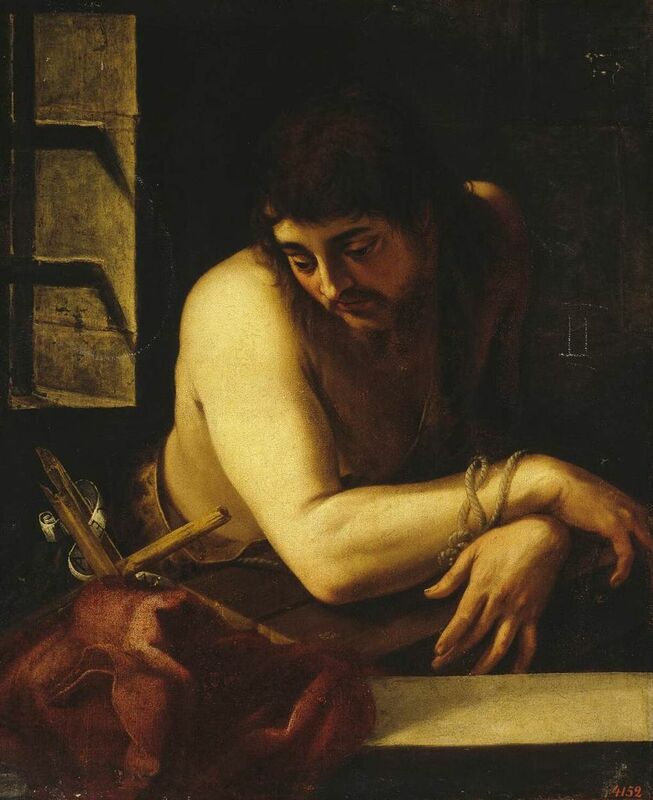 Usually the Church celebrates the day a person died, as opposed to the day a person’s born, but John the Baptist gets both. (His birthday is June 24, by the way). Only John the Baptist, Mary (September 8) and Jesus (of course) get their birthdays observed in the official calendar, as well as the day they died (or in Mary’s case, was Assumed). So while this isn’t the most, er, festive feast, it’s a point of theological coolness. 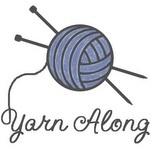 So that Yarn Along post I did yesterday? Yeah, I started working on the piece some more while I caught up on Once Upon A Time, made big mistakes, and had to rip the whole thing out and start again. Sigh. It’s very much two steps forward, three steps back in my knitting. I was purling all wrong. So back to the book today to make sure I’m doing it correctly this time. In rehab–still working on running. I’m at 58 seconds of running without stopping, which is good–gotta break that minute mark next week. I’ve also lost another pound which makes me exceedingly happy. Reading: Kristin Lavransdatter Vol. 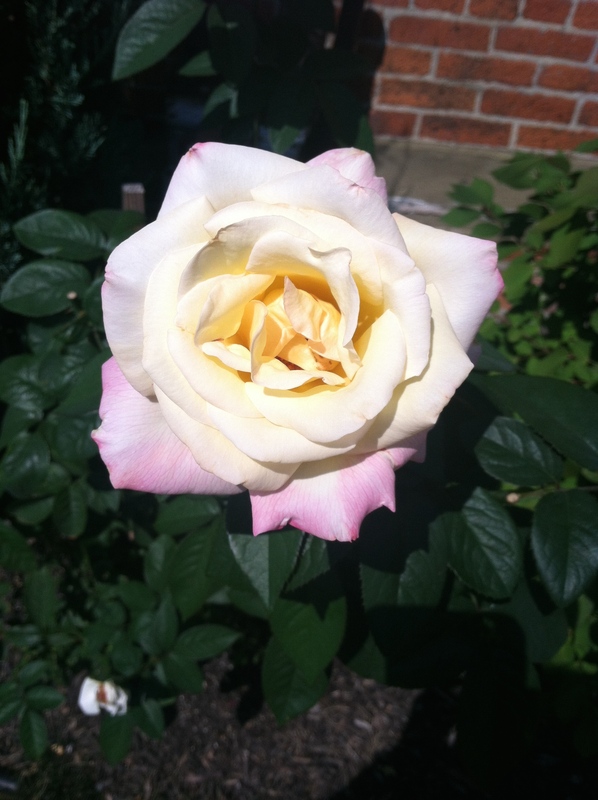 I “The Wreath”; The Happiness Project (again); Summa of the Summa. I also have The Artist’s Way and the workbook, which I’m excited to start next week! Speaking of writing–the beta readers still have the book, but I’m working on making an outline and making sure the order is what I want. I might toy with some new sections over the weekend. You want to know how it’s fall in Ohio? (Or almost) The reappearance of all the Scarlet and Grey shirts everyone seems to have, in various incarnations. They have appeared all of a sudden, because OSU plays Navy tomorrow. So, it’s fall, for all intents and purposes, in the OH. OK, so, we are moving on to NEW patterns! Time for stockinette stitch! This is the outer border, which is done in garter stitch. The yarn is the same as I’ve been using, except in Fairy Tale, and the needles are Caspian Needles instead of Sunstruck. They’re new needles, so I have to sort of get the feel for them, and break them in, so to speak. 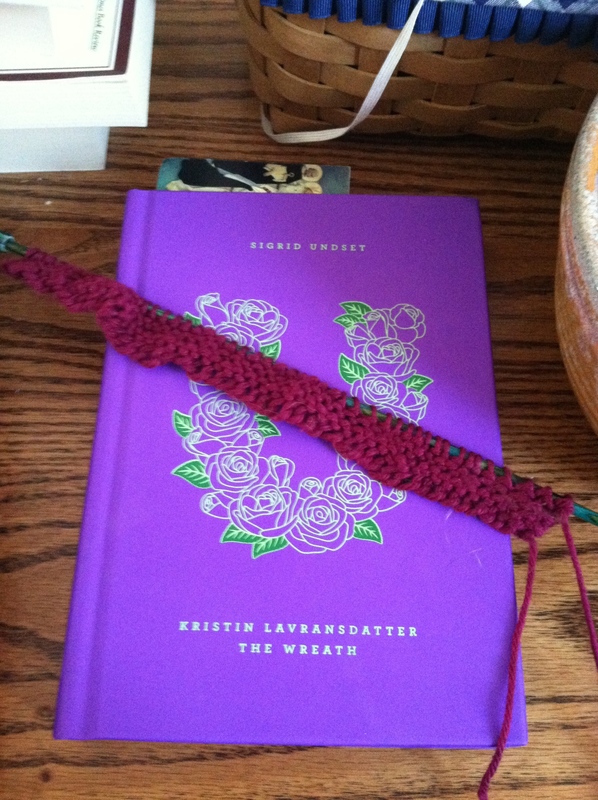 The book is the first part of Kristin Lavransdatter: The Wreath, by Sigrid Undset. It’s the first of the three parts that make up the whole of Kristin Lavransdatter, and if you’ve never read it, I suggest starting with this one, or going whole hog, with this one (which my friend Liz gave me as a Christmas gift many years ago). So yes, I’ve read this book before, but it’s time to read it again, because sometimes we just need to go back to Medieval Norway, right? One of my favorite meals when I need a beach vacation and I can’t leave Ohio. One of my favorite vacation destinations is North Carolina’s Outer Banks. I’ve only been there twice, but every time it’s a week of heaven–swimming, reading, shopping at my favorite Independent bookstore, and eating amazing food. Sadly, I live in Ohio, and I can’t get to the Outer Banks whenever I want. So I love to cook this meal, taken from Elizabeth Wiegand’s Outer Banks Cookbook, when I need an OBX taste in my kitchen. These are two recipes: first, for the shrimp boil, and then the cornbread, because who doesn’t love a good cornbread, right? Reading. That is the sport I was good at. So last week’s project is juuuuust about finished. Surgery impaired my ability to knit for awhile. 🙂 But while watching Outlander again (thank goodness for DVRs!) I did a lot of catch-up, if you will. 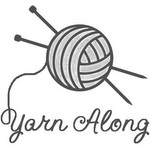 Watching Outlander makes me want to knit; anyone else notice this? Anyway, next week I’ll have–hopefully–stockinette stitch to show you. 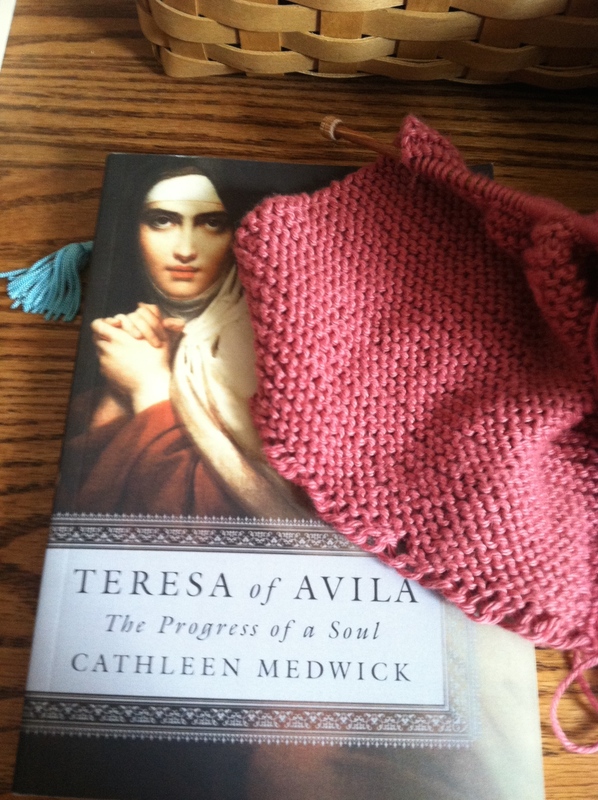 The book is St. Teresa of Avila: Progress of a Soul, and I’m really liking it so far. I’ve read things that the saint wrote, but nothing about her life (I haven’t read her autobiography yet). It’s nice to get the fresh perspective of an outsider, because sometimes if it’s written by a family member or close friend, it can be too much hagiography and not about the saint as person. In my house, currently, the one who leads prayer is me. The one who prays is also me, because I live alone. When I was growing up, my parents took turns leading the prayers. When we were in the car going to school, Dad lead the prayer. At home, mom usually still leads the prayer before meals, and other prayers, it was whoever felt like it. Chapter Nine says that the “women is the heart of the home”, but also that the “family needs this masculine side of things in the same irreplaceable way that they need the feminine. The family needs leadership and a strong example.” (108, 109) I really suggest that you read chapter 9, because one, it’s short (ha) and two, it’s beautiful writing. Chapter 10 addresses difficulties you may have in the house, from actually making a prayer table (finding a space, keeping it clean, etc. 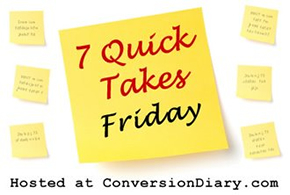 ), having time to pray, “making” children behave during prayer time, and the well-balanced spiritual life. Basically, whether you have kids or not, a husband/wife or not, you need to make time to pray every day. This is sort of nonnegotiable if you want to have a relationship with God that is deeper than surface area stuff. It doesn’t have to be elaborate, just like the oratory doesn’t have to be elaborate. But you do need to pray. We’ve talked about lots of different types of prayer throughout this series, and some of them will speak to you more clearly than others. But prayer is non-negotiable. Start small, but start. If you’re worried about kids not paying attention–it doesn’t really matter. I’m sure–I know–my brother and sister and I didn’t always pay attention during family rosary. Sometimes we forgot where we were in the mysteries, or sulked because we wanted to watch Rugrats, or were thinking about the sleepover we were having that weekend. Whatever. But he important thing is that our parents prayed with us, on a pretty regular basis. There were Catholic statues in our home. We had holy water fonts in our bedrooms. Prayer was something we did on a regular basis, and it was something we saw our parents doing on a regular basis. We each had our own rosaries and had Catholic movies we watched to learn about the saints. Eventually, all of this seeps in, and we remember these things. Sometimes you may despair of them learning anything (I teach first grade CCD, I know about this), but you’ll be surprised at how much they are actually learning and absorbing. Your example is a powerful one. Make it count.